As you’ve hopefully heard by now, October is breast cancer awareness month. Several nail polish bloggers have organized the Polish Us Pink campaign, through which they will be posting pink manicures on Mondays throughout the month to help raise awareness. 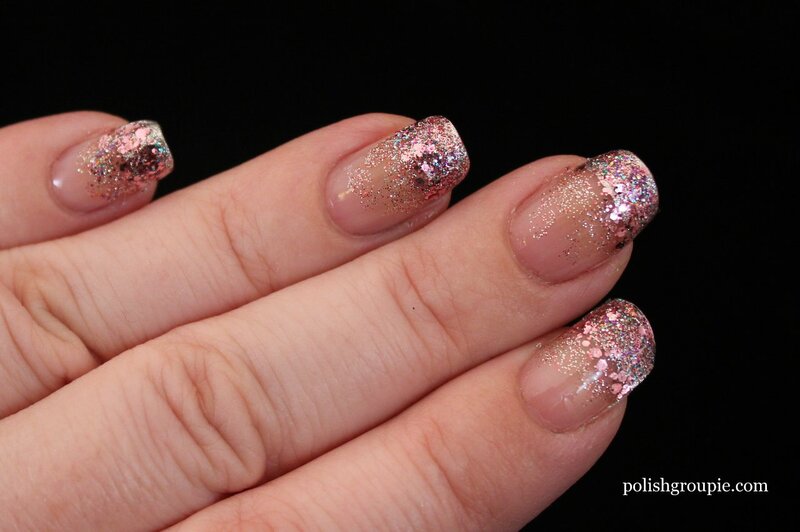 I’m joining in with today’s pink glitter gradient, which is dedicated to my grandmother. She was a breast cancer survivor. 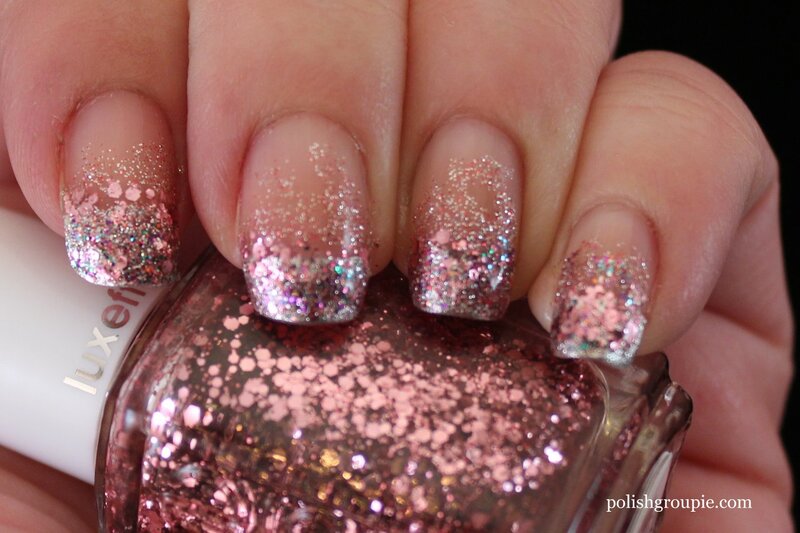 This manicure is similar to the silver and gold glitter gradient I did last month. There’s a link to a tutorial in that one if you want to learn more about the technique. I started with a clear base coat and then added Sonia Kashuk Smoke And Mirrors, a silver metallic, to my tips (in retrospect I wish I had started with a pink polish instead of the silver but at the time I wanted something metallic. I now think something shimmery pink would have been fine). I then brushed on Essie Luxeffects A Cut Above (medium and small pink hex glitter in a clear base), concentrating on the line where the tips met my nail to start the gradient. 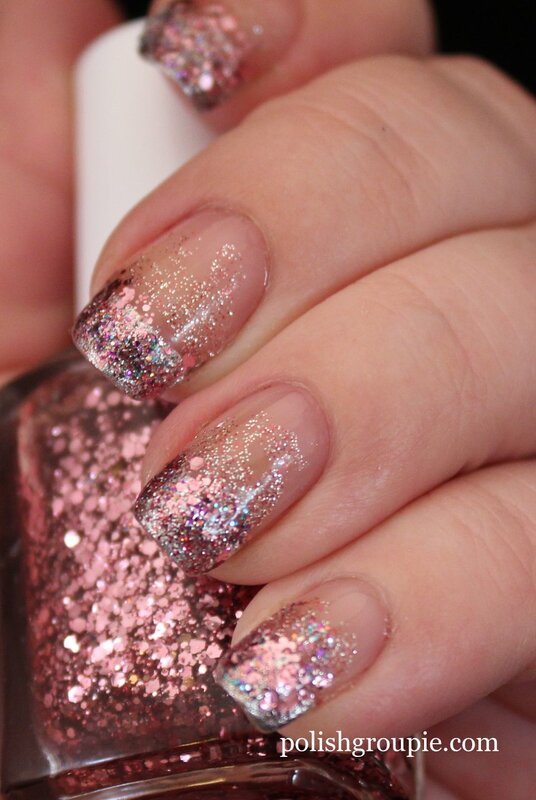 I added on a little bit of OPI Mad As A Hatter, which is a much-coveted densely packed multi-glitter with pink, purple, silver and turquoise, spreading that to about the halfway mark. And to top it off I layered on Ulta After Party, which looks pink in the bottle but I think technically is just red and silver micro glitter, bringing that almost the the cuticle line. For more about breast cancer, please visit the breast cancer page on the American Cancer Society’s Web page, which has lots of information about mammograms, treatment and how to get involved with the fight for a cure. I had the idea for this manicure pretty early on but it took me a little while to figure out exactly how to portray it. 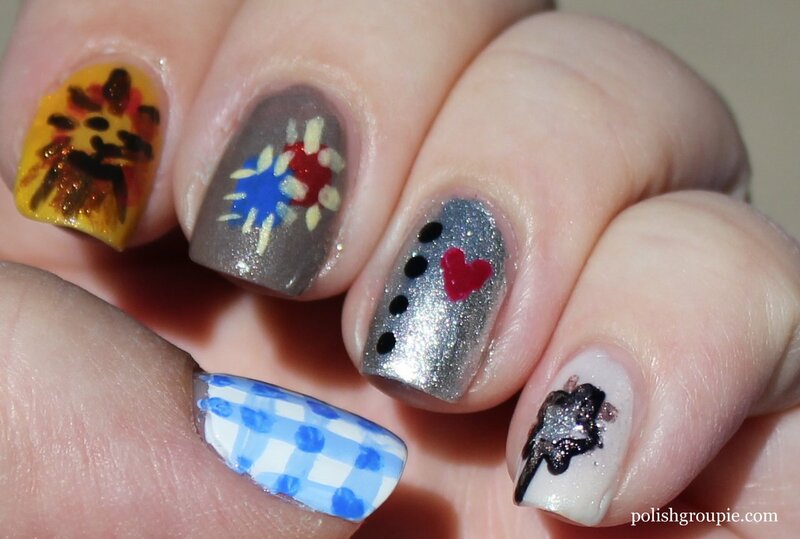 Day 23’s manicure theme is inspired by a movie, and the movie I chose is The Wizard Of Oz. My thumb is for Dorothy, a blue and white gingham pattern like her dress. I used Ulta Snow White as the base, my untried for the 30 Days of Untrieds challenge I’m doing simultaneously. For the stripes, I used Nails Inc. Baker Street. I mixed it with white for the lighter shade of blue. My index finger is for the Cowardly Lion. The base is Sinful Colors Let’s Meet. 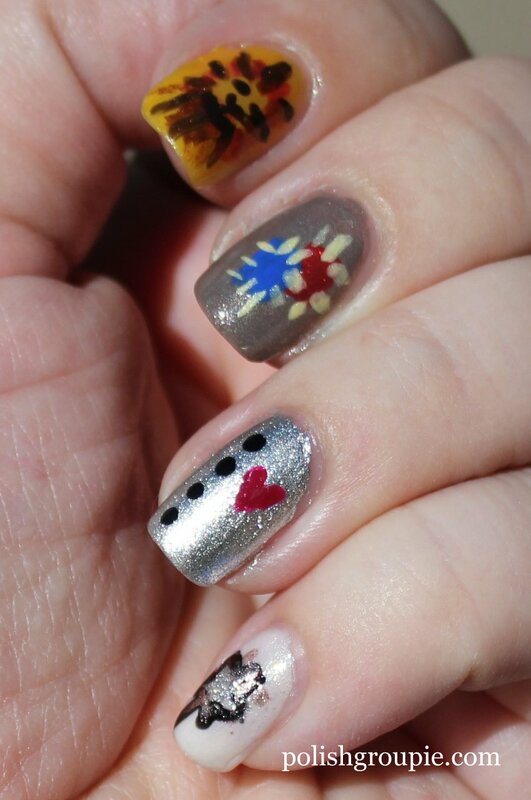 The middle finger is patches for the Scarecrow, on a base of Essie Mocacino. 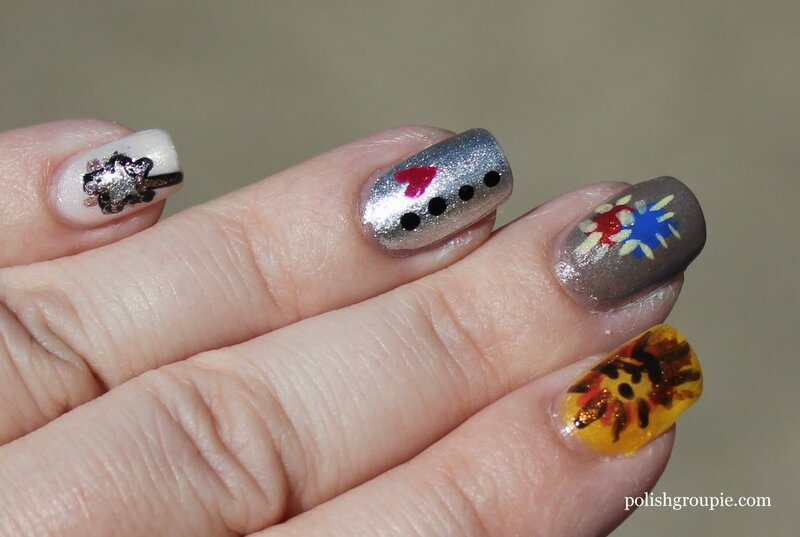 The ring finger is for the Tin Man getting his heart, on a base of Sonia Kashuk Smoke And Mirrors, and the pinkie is Glenda the Good Witch’s wand, on a base of Sinful Colors Social Ladder. I used a bunch of other colors and lost track a little bit. 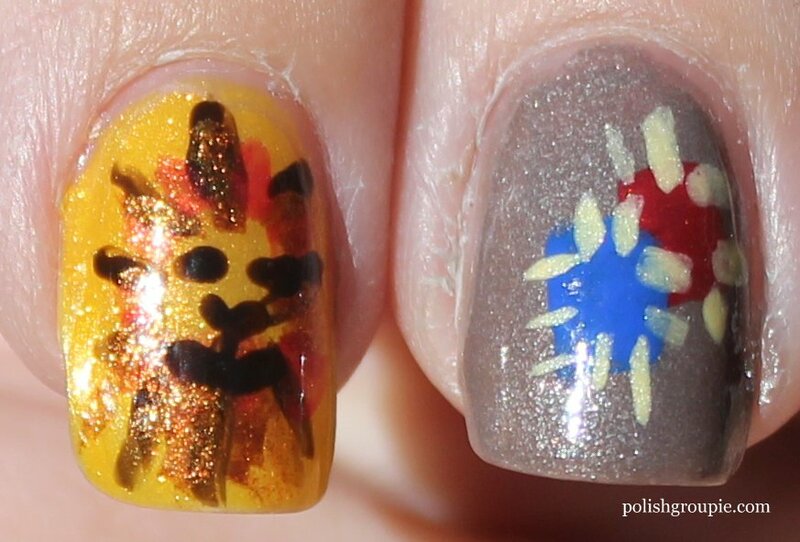 I know there’s some Zoya Codie in the lion’s mane and the face, the patches are Nails Inc. Baker Street and Essie Very Cranberry, which I also used as the heart. The wand is silver and black striper polish from Kiss. I topped it off with Poshe fast-dry top coat. Please visit some of the other bloggers that are participating in the 30 Day Challenge this month. I figured from the get-go that I wouldn’t be able to pull off anything too extravagant for Day 14 of the 30 Day Challenge. 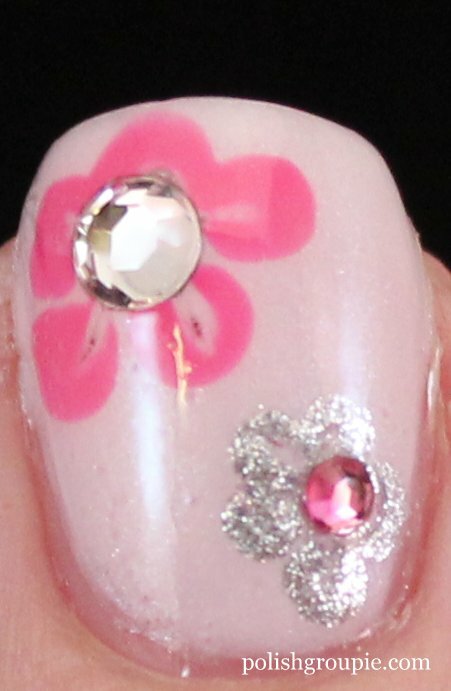 But I didn’t want to do just basic dot daisy flowers, so I looked around for some other options. I found this video tutorial on a modified dot daisy and decided to use that but in a different design. To satisfy the 30 Days of Untrieds challenge that I’m doing simultaneously, I started with three coats of A-England Iseult, a pale shimmery pink creme. This is a great, versatile color. 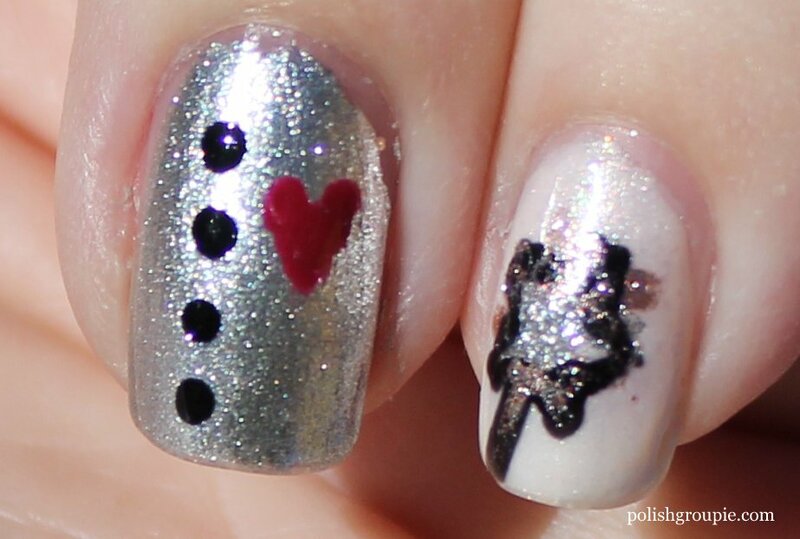 It’s pretty on its own but also provides a great backdrop for nail art. 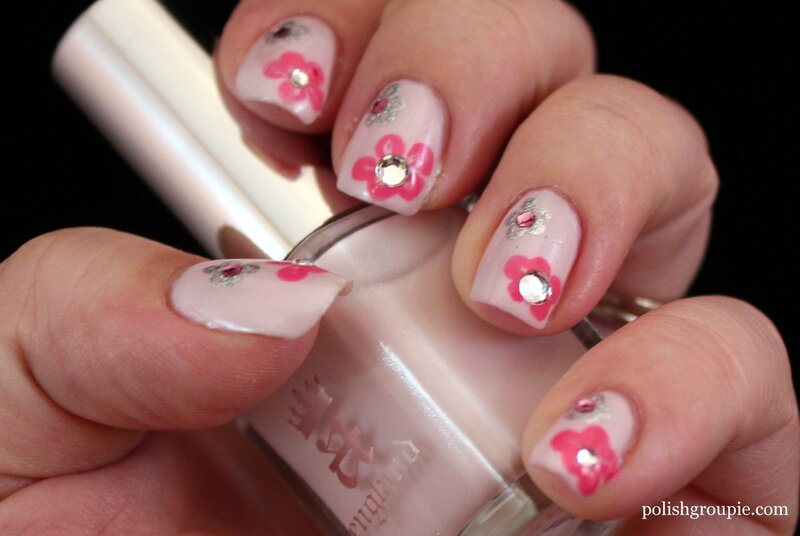 For the flowers, I started with Zoya Jolene, a bright pink creme, and used the head of a pin as a DIY dotting tool. I started with five dots to create the flower, and then used a toothpick to drag from the center of each dot to the center of the flower to create some lines on the petals. I then used the same technique with Sonia Kashuk Smoke and Mirrors to create a smaller silver metallic flower with a small dotting tool. 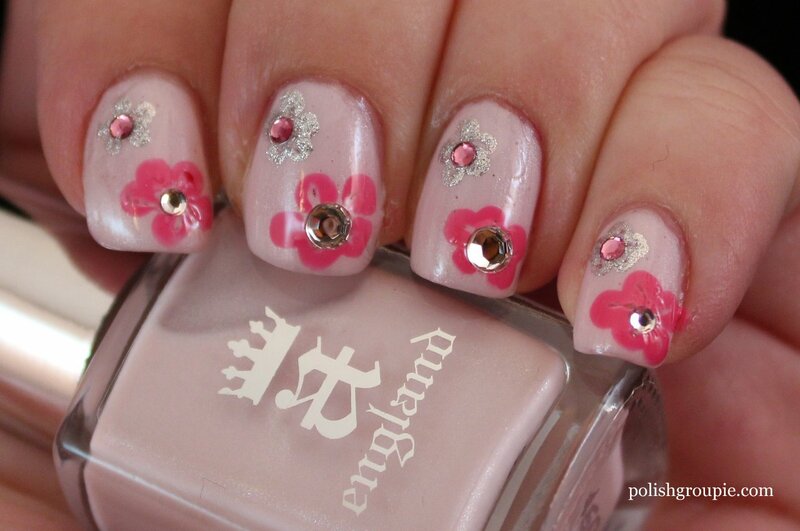 I applied one coat of regular top coat and then added clear and pink rhinestones, some bigger some small. I sealed them with one coat of Poshe. It wasn’t too challenging but I think it’s cute. A nice easy way to do a fun design. 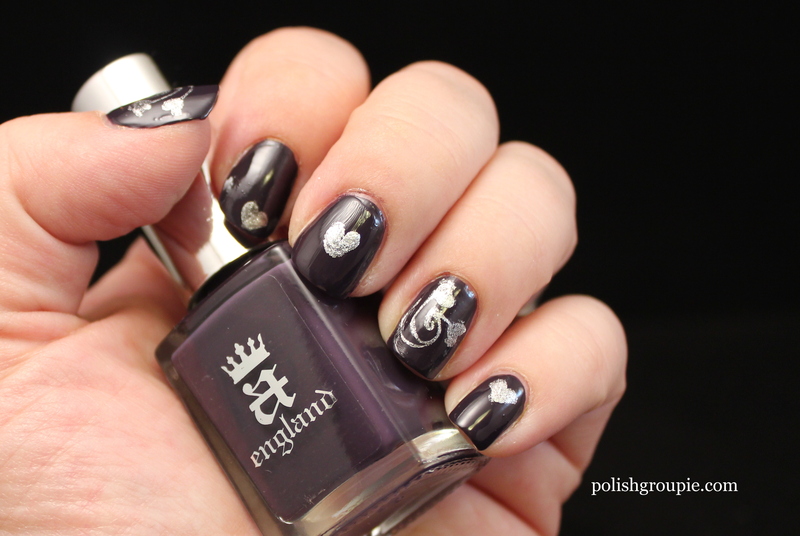 As soon as I looked over the requirements for the 30 Day Challenge I knew right away what polish I would be featuring on Day 6 when we got to violet: A-England Elaine. 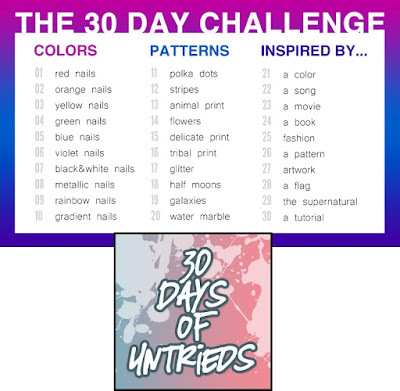 I’m simultaneously doing 30 Days of Untrieds, this covers both challenges. 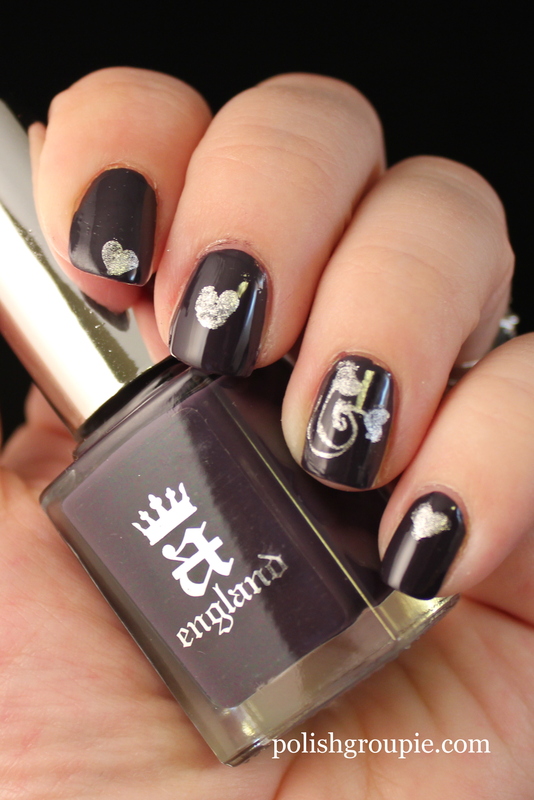 I got A-England Elaine (untried) along with three other polishes from the company’s The Mythicals line in July when the company offered its mega-sale, and I’ve been dying to try it ever since. It is described by the company as a “smoky violet amethyst.” Yum. I’ve read a lot of blogs that sing the praises of A-England and its incredible formula. I’m happy to say that these reports are NOT greatly exaggerated. Elaine is a beautiful polish that goes on very easily with a high-gloss finish. This is two coats of A-England Elaine. No topcoat, and look at that shine! Perhaps I should have left Elaine to her own devices, but I wanted to add some stamping to this mani. I recently bought the Salon Express kit off of Amazon for about $5, which I would recommend as a great starter kit for anyone that is curious about nail stamping but doesn’t want to devote a big budget to it out of the gate. I’m still working on getting the stamping technique down, and I don’t yet own any stamping polishes. This is Sonia Kashuk Smoke And Mirrors, a shiny metallic silver polish. I used a larger tri-heart design on my ring finger and then a small heart on my index finger. Then I tried to freehand hearts on my middle finger and pinkie.